More information: Unplugged versions from their respective back catalogues showcasing songs they have individually written for Mostly Autumn, Halo Blind (nee Parade), Odin Dragonfly and The Evernauts. “We’ve always enjoyed sitting around a table with a big glass of wine and a few candles, singing harmonies on each other’s songs, and thought it would be brilliant if we could share that mood with an audience and capture it on record,” says Chris. The stripped down arrangement of 2 voices, guitar and percussion, plus a few cases of wine, a whole load of tea-lights and the confident and easy relationship the pair had with the audience made for a magical environment for an album to be created in. 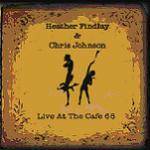 Live at The Café 68 is the album that was recorded that evening.The recording ended with a photo of Heather and Chris with the audience, which is included in the artwork of the album.